It's all thanks to a group of scientists from Australia and Micronesia who have found by measuring how far fish travel, habitats can be better protected. 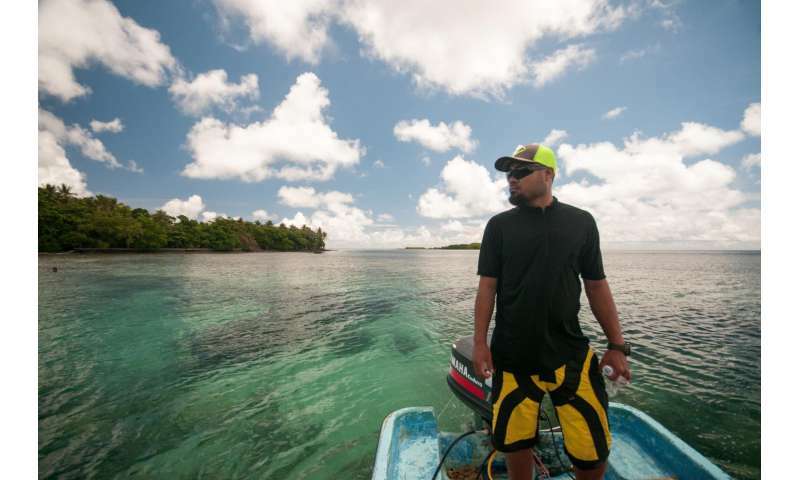 Researchers targeted the island of Pohnpei as a case study to examine how effective their designated marine protected areas (MPAs) are for conservation and fisheries management. "We asked local fishers to tell us the top ten species they wanted to protect and found the majority of MPAs in Pohnpei were too small to protect the fish they cared about the most," said Dr. Rebecca Weeks from the ARC Centre of Excellence for Coral Reef Studies at James Cook University. While some fish spend their whole lives moving no more than a few hundred metres, others will travel hundreds of kilometres every day. The fishers ranked favourite food fish - Groupers, Rabbitfish, Parrotfish, Surgeonfish, Snapper and Trevally - along with those with cultural and conservation importance (Humphead wrasse and Bumphead parrotfish) as the most important species. "We then calculated the home range of each species - the area where a fish spends most of its time eating and sleeping. "We know that if their entire home range is within an MPA the fish will be protected but if the MPA is too small then it is likely the fish will swim out of the safe zone and risk being caught. "By focusing on particular species that the fisherman care about and using information on the ecology of those species, like how far they move on a day- to-day basis we were able to determine how large no-take zones actually needed to be." "We then took that information to community workshops and involved local fishers in the conversation which has resulted in the creation of larger MPAs." Since the study, Pohnpei has established its largest MPA called the Palikir Pass Marine Sanctuary. The location is better known to many as P-Pass, a world class surf break. Pohnpei is committed to achieving international targets for biodiversity conservation through the Micronesia Challenge, and has already protected 30% of its marine and 25% of its terrestrial habitats. However, not all of the MPAs on the reefs surrounding Pohnpei are performing well, as many are too small. "MPAs could be designed more effectively all over the world. You get conservation scientists and NGO's who say you need to make closures as large as possible but that doesn't really resonate with people," said Weeks. "The larger the area set aside for no-take zones, the smaller the area for fishing. There is this trade-off between livelihoods, food security and conservation and people are less likely to follow the rules if they don't see how they will benefit from them. "Because we focused the conversation on the fish they wanted to protect, it engaged more people. "We anticipate that focusing on these species will mean better protection and an increase in their abundance which will ultimately benefit both conservation and local fisheries.